The Kiddie Station is both elegant and functional. 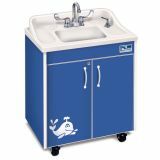 It combines a beautiful, roomy maple laminate changing table with the convenience of a portable hygienic hand-washing station. 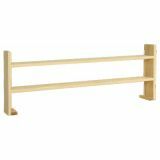 A perfect fit for infant rooms, church nurseries and child care. The 7" deep changing deck meets state and local requirements. Includes a soft 1" thick washable changing pad. Plenty of storage area under the changing deck and includes one, fixed-shelf. Locking cabinet keeps out curious little hands. Swivel casters for easy mobility. Holds up to 40 lbs. Minimal assembly. 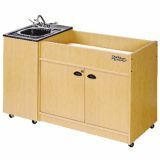 Overall Dimensions: 39"H x 56.5"L x 25.5"W. Changing Table Deck Area: 7"H x 39"L x 22.375"W. Additional shipping charges apply. Make filling your Clean Hands Helper easy! 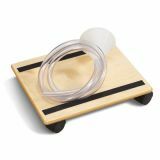 Kit includes a handy mobile cart and 60" hose with funnel. 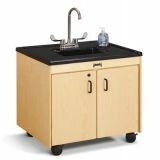 Cart features four casters and two non-skid strips to prevent the tank from sliding around while transporting. 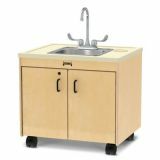 Cart and hose fit inside the sink cabinets for easy storage. 15 1⁄2"W x 13"D x 3 1⁄2"H. Weight 6 lbs. 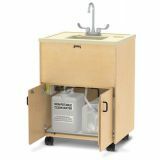 Set up a portable hand washing station without plumbing! Water is heated by a tankless, on-demand water heater. The water pump has a flow rate of up to half a gallon per minute. Clean water tank holds 5 gallons; waste water tank holds 6 gallons. Sinks are approximately 5" deep. Includes power switch inside the cabinet and openings for cord management. All units are 28 1⁄2"W x 23 1⁄2"D. 1-year warranty. 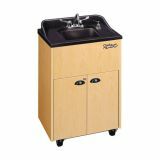 All portable sinks deliver instant hot water, are easy to use, and include tech support. 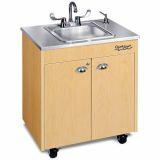 • Hot/Cold Water System • Multiple Top and Basin Options • Water Tanks: 5-Gallon Fresh, 6-Gallon Waste • Locking Cabinet with Safety Swivel Casters • Quick Connect Tank System • NSF Certified (Kiddie Station excluded) • Two-Year limited product warranty • Grounded, dedicated 20A circuit breaker • Dry level surface • Extension cords must be rated 20A or higher Additional shipping charges apply. Give even the smallest of toddlers and children the boost they want to independently wash their hands. The Original Lil' Step® is the perfect Lil' Premier Series portable hand sink accessory. Better than tiptoes, this quality-constructed step gives kids an extra 6 ¼ inches in height, allowing them to reach the hot water and soap to thoroughly wash their hands anytime. 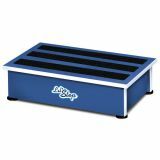 Featuring slip resistant rubber feet and safety strips on top, little ones are sure to be safe atop this step. 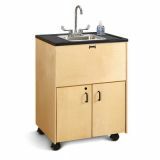 And because it perfectly matches the maple or cherry finish of the Lil' Premier portable sink, classrooms and hallways will look orderly and attractive. The dimensions for the Original Lil' Step is 23 1/2”W x 13 ¼1/4” x 6 ¼1/4”H. Holds up to 300 lbs. It will safely provide thousands of little boosts for thousands of little tykes.